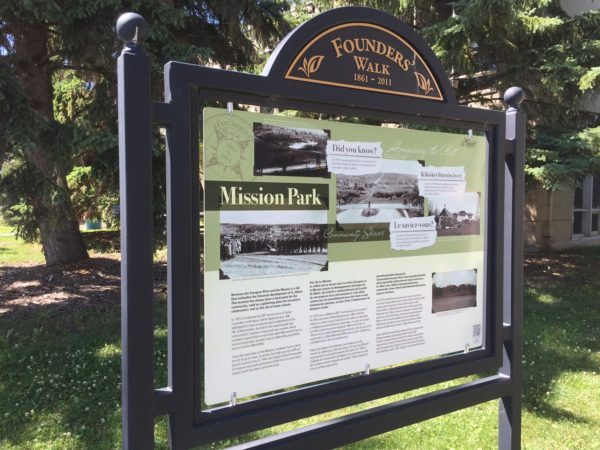 Between the Sturgeon River and the Mission is a hill that embodies the historical development of St. Albert. This location has always been a focal point for the community, used as a gathering place for recreation, celebrations, and as the site of many schools. In 1899, people gathered here to watch the first fireworks display in Alberta, celebrating Father Lacombe’s golden jubilee. In 1929, to celebrate the 80th anniversary of Father Lacombe’s ordination, Father Alphonse Jan, OMI, attempted to have a national park established on the hill. Unfortunately, the bid for the national park was unsuccessful. Instead, a local park was created, which included a gracefully curved road called Memorial Drive, to honour those who served in the St. Albert Mounted Rifles and in the First World War. 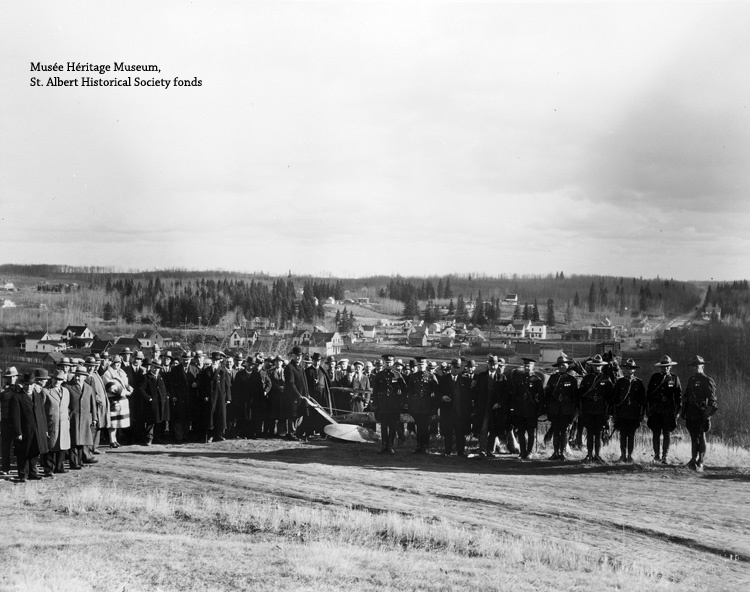 Sod turning at Mission Park, Oct. 15, 1928. Since the early days of the Mission, residents had to climb the hill to go to mass. In winter, this task was very difficult due to ice and snow. In 1944, the Chapel of the Immaculate Conception was built at the base of the hill as a secondary chapel and it has been used ever since. La colline qui se dresse entre la rivière Esturgeon et la Mission incarne le développement historique de St-Albert. Cet endroit a continuellement été le point de convergence de la communauté et a été utilisé comme lieu de rassemblement pour des loisirs et des événements spéciaux, en plus d’être l’emplacement de plusieurs écoles. Les gens se sont rassemblés ici pour voir les tout premiers feux d’artifice en Alberta, qui commémoraient le Jubilée d’or du Père Lacombe en 1899. En 1929, pour célébrer le 80ème anniversaire du sacerdoce du Père Lacombe, le Père Alphonse Jan, OMI a tenté de mettre sur pied un parc national sur la colline. La tentative a malheureusement échoué. Cependant, un parc municipal fut créé, autour duquel se dessinait Memorial Drive, un chemin aux courbes élégantes qui honorait ceux qui servirent auprès des St. Albert Mounted Rifles ainsi que les soldats qui s’enrôlèrent lors de la Grande Guerre. Depuis les débuts de la Mission, les résidents ont dû monter la colline pour aller à la messe. En hiver, la difficulté augmentait à cause de la neige et de la glace. En 1944, la chapelle de l’Immaculée Conception fut construite au pied de la colline comme chapelle secondaire. Cette chapelle est encore utilisée aujourd’hui. Tastawayihk Sturgeon River ekwa Ayamihewînînâhk ekota ispatinâhk miskenânawan kayâs âcimowina St. Albert ohci. Kâkike mamawipayinâniwan, emetawehk, ekwa mihcet kiskinohamâtowikamikwa papami cimatewa. Ispî ekwa 1899 kîmamawopayiwak ayisiyiniwak ekitâpahtahkik nistam ewâsaskotepayiki pâhkisikanisa Father Lacombe Golden Jubilee ohci emiyawâtahkik. Memorial Drive ehisiyihkâtek simâkanisihkâninâhk kâkînitawinôtinikecik nistam kânôtinitohk World War I ekwa aniki kâkîwîcihiwecik St. Albert Mounted Rifles. Oskac kâkîmâcihtakohk ayamihewînînâhk, ayisiyiniwak kîhâmaciwewak tanitawâyamihâcik ispatinâhk. Pipohki mistahi kîhâyimîwak kônihk ekwa miskwamîhk tapimohtecik. Piyisk kîhosihtâniwiw capasis ispatinâhk ayamihewikamikos Chapel of the Immaculate Conception ehisiyihkâtek, ewako 1944, keyâpic anohc apacihtânawan.